The wait is almost over for the release and unveiling of the Samsung Galaxy Note 3 as the company has just sent out invites via Twitter for the Samsung Unpacked 2013 Episode 2, and the company has also revealed the live streaming details of the event with times. 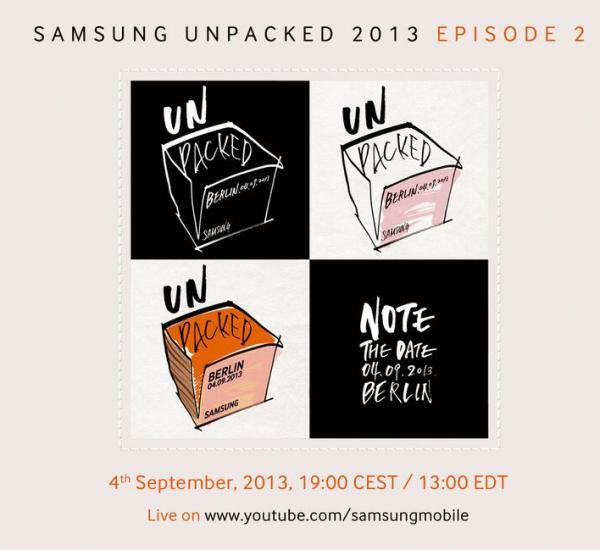 There are many that are looking forward to the unveiling of the Samsung Galaxy Note 3 and today we can tell you that the device will be seen in all its glory on Wednesday September 4th in Berlin Germany, which was a date tipped just a few days ago. The event kicks off at 19:00 Central European Summer Time or 13:00 EDT and the company has revealed it will be streaming all the happenings on its YouTube channel here. There has been a lot of speculation for the handset with the device believed to feature a Full HD 5.7-inch touchscreen display with the Qualcomm Snapdragon 800 processor under the hood. Whatever Samsung has in store for the smartphone world we are now just under a month away from finding out officially. Are you planning on getting the Samsung Galaxy Note 3? You bet I am but now it has some stiff competition for sure. The main thing I want to be able to see the screen out doors. That is very important. Give me Gorilla Glass 4 and the Snapdragon 800 and we will be good to go. Would love to see wireless charging. It wouldn’t take much for this phone to outsell the S4. We are now in the generation of smart phone and tablet integration. We need a phone with a 5.7″ screen and the ability to last 24 hours. I want it NOW!! !